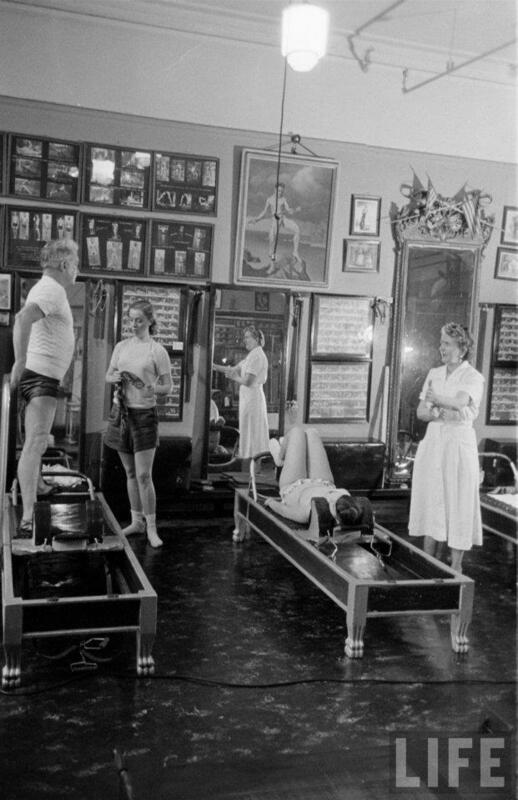 Joseph Pilates was born in Germany on December 8th, 1881. His mother was a neuropath and his father a gymnast, and as he grew up he had a natural interest in health and movement. Joseph was a sickly child with ailments such as asthma, rickets and rheumatic fever, but to combat his ill health he participated in sports such as gymnastics, boxing, body building and skiing. His health and form changed so considerably that by the age of 14 he even modeled for muscle charts! Shortly after the start of World War 1 in 1914, Joseph was interned as a German National in a camp in Lancaster. There he taught wrestling, self-defence and fitness, here he began developing his system of ‘Contrology’. He created his exercise apparatus from bedsprings, using them as resistance training for the soldiers that were bedridden. Joseph immigrated to America in 1925, and in 1926 now married to Clara a nurse he met on the voyage, he started teaching. He taught a diverse population, including business professionals, doctors, New York high society, gymnasts, dancers, actors; historic notes even mention the early movie stars Vivian Lee, Sir Lawrence Olivier and Katherine Hepburn. He truly believed that his system developed a balanced body and mind, which would lift your spirits and enhance one’s life. He wrote two books ‘Your Health” (1934) and ‘Return to Life” (1945). It horrified Joseph to see such a lack of balance of body and mind in the ‘Modern World’ and in medicine. It shocked and appalled him to see the lack of regard people took in their health and believed that Contrology should be embraced by society, school system and the medical system. Joseph died in October 1969. Unfortunately he had become quite disillusioned with the lack of acceptance of what he had to offer in the US Medical and Health circles. He did though leave the disciples of his teachings, referred to as Master Teachers or the Elders. These teachers carried on his work, his legacy, and developed the method further.